As the World Cup came to an end in the most disappointing of circumstances for Japan their players and fans alike kept their heads held high. All tournament its been reported the Japan fans along with other nations have helped clear the stadium after games. 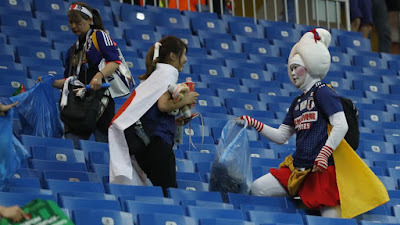 It did not make a difference if they won, drew or lost after each game the Japan fans would help clear rows of seats around them. Fans were seen with bin bags after games going row to row clearing the mess made throughout the match by supporters. Journalist Scott McIntyre told the BBC last week "It's not just part of the football culture but part of Japanese culture. You often hear people say that football is a reflection of culture. An important aspect of Japanese society is making sure that everything is absolutely clean and that's the case in all sporting events and certainly also in football." This was then continued by the Japan players after their defeat to Belgium in the round of 16. The players who after the match were left in tears and found it hard to even speak with the media could be forgiven for wanting to get back to their hotel. Although that was not to be the case as the players cleaned their dressing room after the match leaving it spotless. To add to this they even left a thank you note written in Russian.